Fifteen years ago, the music of ETHNOS would have been found in the World Music bin of your local record store. As the world becomes increasingly interconnected, however, these institutions and categories become increasingly meaningless. The boundaries between musical styles and traditions are already messy, and now, because so much music is now instantaneously available for perusal, there are more opportunities for cross-cultural collaboration than ever. Since 2013, ETHNOS has been an unfolding examination of the tension between musical diversity and commonality. At its foundation, ETHNOS seeks to explore cross-cultural musical commonality, such as the relationship between Latin American and traditional West African rhythms, or the shared improvisational approach of jazz and Indian classical music. 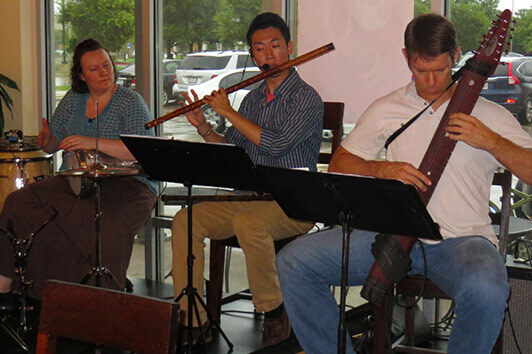 Simultaneously, the band is inspired by the collision of diverse music styles, such as applying Karnatak rhythmic principles to a British pop song or Indonesian metric structures to traditional Japanese music. Every performance by ETHNOS is different because our music is founded on improvisation and the fusing of diverse music styles.